I founded the WiCC in 2012. I have travelled in Cuba since 1999 and became very impressed by the character of many women whom I met and watched. Lessons in stoicism, stamina and elegance, a celebration of bodies and brains ! Over time, I decided I wanted to provide a platform for women to discover the pleasure of cigars, to meet people who like cigars and in so doing, gain confidence about themselves and learn about the world of cigars. In my professional life I am a chef and event producer. I developed a passion for cigars in a similar way to how, over 27 years, I learnt about food, wine and music – by osmosis, through a determined curiosity, with a degree of courage, and by the generosity, inspiration and support of people I have met along the way. I wanted to create an arena where as many women who will join us can share these and others experiences. For me, two of the most important aspects of the club are that it offers an opportunity for women to feel uninhibited about trying cigars, and to develop friendships with likeminded people. There are some common threads for conversation – including: How do you smoke? Do you smoke like men? Do we appreciate the same kinds of cigars as men? Where do I start? I have discovered that there are many women who are in a relationship with cigar enthusiasts (or who might like to meet someone who has similar interests but dosn’t smoke). The comment – “I like the smell of cigar smoke but I don’t smoke and wouldn’t know how to”. Or ” My husband/partner/friend smokes but I don’t go to cigar events with him because I don’t smoke.” This is often followed by the query….”if I join the club, will there be things for me to do?”. 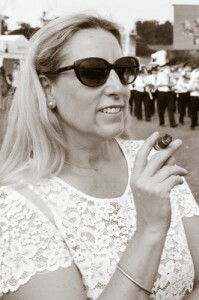 It showed me that women are intrigued about smoking cigars, or at least to find out what is so interesting about them! The answer is of course, “yes! plenty to get involved in!”, and the best way to gain interest or confidence is to join the club and learn with friends. We have developed a range of offerings for the WiCC which include interesting travel, great food and drink, music and other cultural interest, and we are currently working on a wonderful shopping range. Cigars are always a feature at our events! but we aim to be inclusive for non-cigar smoking friends and relations. Non-members can often join in our events and our WELCOME membership is also available to men. After considerable thought, we have decided to simplify life and offer only one membership level. We will continue to offer the Welcome membership, with a modest fee of £20 per annum to cover costs of our online presence and admin. The details of the benefits of this membership are shown on the Membership page. We produce events currently in the UK, Cuba, Italy and in Croatia, but we have plans for co-producing events elsewhere in Europe (Berlin, Amsterdam and Paris) and the USA . The club is still young, and we want to grow steadily. We are in no hurry, but I am confident that we have many fun opportunities emerging for members in the coming years.